Happy Friday!! Mother Nature is putting waaay too much Bailey’s in her PSL’s because how can it go from High 80’s the beginning of the week to a HIGH of 50 today? BUY I love it and I LOVE October!! A low of 35…looks like a Winter Coat at the last Regular season football game. We'll bundle up, drink Hot chocolate and eat mom's Caramel Corn. Spent all of last night watching Mr. Nine run the chainsaw and I took it all to the burn pile..a tree fell in our woods on Tuesday night, crazy and scary! Hoping to see A Star is Born this weekend. Has anyone seen it? Love me some Bradley Cooper and Lady Gaga and that song Shallow is on repeat!! Senior Night could not have been on a better date! I was home the day before from Nashville, The boys were both able to come home from college then and the night was the perfect temps…low 60’s and after a rainy dreary day..none in sight! Didn’t even mater that they lost as our #9 hit em’ hard and caught a punt return. Love me some Friday Night Lights, gonna miss it next year! 2. Fall Find PUMPKIN PATCH!! Sorry doing a favorite Fall Place instead. Pumpkin patches bring me joy. Last Friday, I mentioned the yummy pumpkin ice cream I had in Tennessee. Well my mom loves it too and mentioned going to get some at Fashion Farm, a pumpkin patch that’s been around since 1960. We also did a photo shoot for an outfit for next Wednesday's theme. But that included a Flannel so after the shoot, changing was a must as it was 85 degrees. It’s not your average pumpkin patch, it includes the pumpkin fantasy land where they display pumpkins decorated like historical figures, singers, planets, cartoon characters, etc. with sweet pumpkin signs of wisdom spread throughout. My favorite displays were the presidential and Dolly Parton. See the 29 cents per pound pumpkin sign? Well, you'd think "9" would be my favorite number with my last name and all, but it is actually 29! You know I love to bake and prefer a homemade cookie, but shortbread, well I usually don’t bake shortbread cookies but they are ones I’ll buy if utterly delicious and these new mini caramel shortbread ones are heavenly. They were on sale this week so I went back and bought two more boxes. I was extra digging the posts I shared this week as on Monday, I got to gush about my love and the ladies of the Nashville trip, Tuesday, my scrumptious Pumpkin Nanaimo Bars got shared and Wednesday, I broke out the tulip hem jeans and pretty olive sweater. 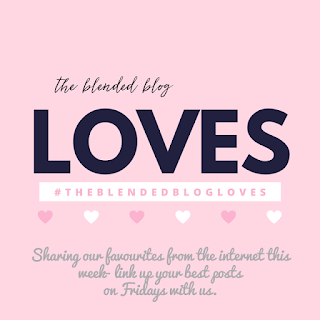 Speaking of Loves, I'm hosting Friday Loves over at The Blended Blog today so make sure you get over there and link up your favorite post from the week. Happy Friday Girl! I love that pink cardigan. Have you tried to pumpkin ice cream at Trader Joe's? So Good! I totally know how scary it is to have a tree come down as we live across the street from the woods. Oh my goodness, I always love your Friday Favorites and this one did not disappoint! So much goodness. Love seeing you with all your sweet boys and the pumpkin patch was over the top cute! Those daily outfits of yours are so stylish. Thanks for the shout out my friend - that was so funny when we styled those cardigans almost identically! Have the best weekend beautiful! So glad all your boys were able to come home for Senior Night! Happy Friday! I'm glad that senior night was such a great night & that both of your college boys were also able to make it home. That's really sweet. October is my fave too! I absolutely love that family picture at the top! Most beautiful family ever!! Have the best weekend ever! The hurricane rolled through yesterday and now it's 50 degrees....I'm not dealing. Yay for your fun pumpkin patch! I think I am going to pick up pumpkins today for the kids to decorate tomorrow! Love ya! 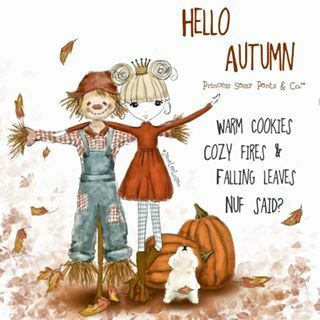 I love October too because it means more family time! My family's birthdays land towards the end of the year so get togethers are nonstop! Love your cute plaid top! It's very pretty and those colors are just screaming Fall! Enjoy the movie and let me know if you like it. Happy Friday! Isn't this weather crazy?!? That pumpkin patch looks like so much fun. Have a wonderful weekend! Stay warm at the FB game. WOW that pumpkin patch looks like a blast!! Love all of your cute and stylish outfits! Ah, that pic of your family on the football field is fabulous! You all look SO good! And in case you don't see it over there- thanks for the feature on the Blended Blog. You're too kind. :) As always, I love your weekly outfit roundup!! Such cute looks! Your posts are so smile inducing! Love it all and love you, sweet friend!! Hooray for such a sensational Senior Night enjoyed with your family! My heart just overflows with fall joy when I see you surrounded by pumpkins too! :D Sounds like you and your man are the perfect team and I'm glad you were able to take care of that fallen tree together! 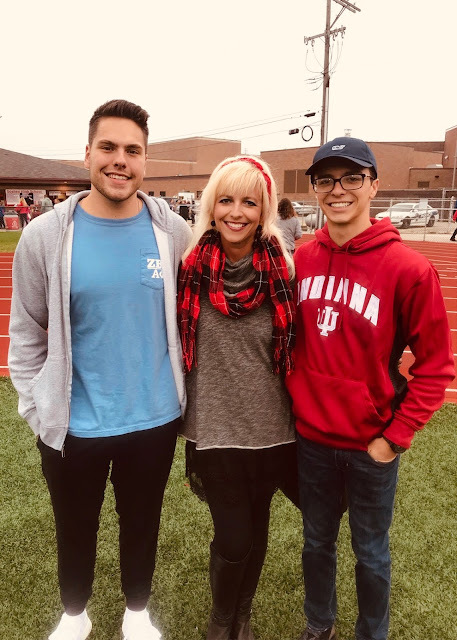 Have fun at the football game tonight - bundling up with hot chocolate in one hand and caramel corn in the other while cheering on your love sounds like the perfect way to kick off the weekend!! xoxo! Those pumpkins are so cute!! I love the short sleeve plaid shirt! Have a lovely weekend and enjoy October! That pumpkin patch looks like so much fun! 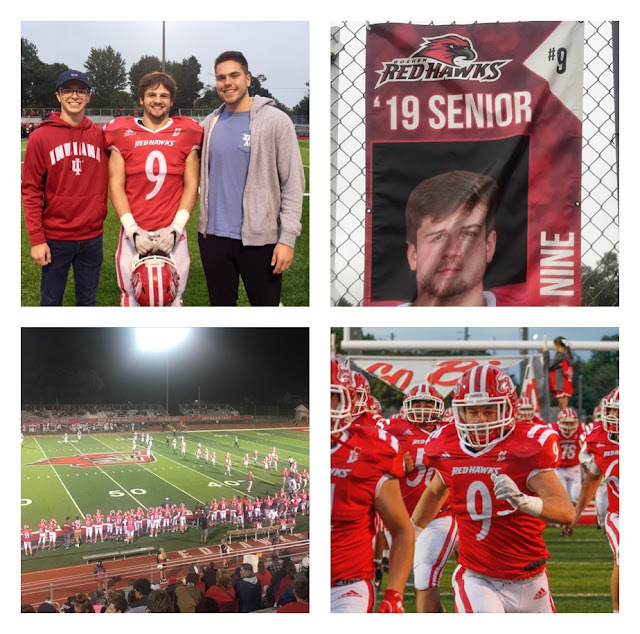 I love that all your boys were home for the football game and go #9. I love it! The temps for this weekends game (in the 30's) sound actually really cold but wonderful! I love fall! Enjoy your weekend! Our weather has been crazy here too. The kids were out sledding in a light snow Tuesday and now today it's going to be sunny and 61! I will take it though!!! Love all your outfits! And that trip to the pumpkin patch looked fun. Glad you got to do that with your mama. So special that both college boys were able to come back for Senior Night! I love a good pumpkin patch, we need to try to take Zoe to one this year. I hope you have a wonderful weekend! Enjoy that cool weather! Oh my goodness...those pictures of you and your boys, Andrea! I love that you're the queen of your castle with such handsome men! Also, your weather looks DIVINE. We've had some bipolar swings, but for the most part, it's beautiful and cool now...and I'll take it! Happy weekend! Well now I need a pink cardigan and a trip to the pumpkin patch! The weather definitely turned on a dime. It's putting me in the chili and football mood. Give me all the punkins!! I do believe how much you love the pumpkin patches just because of your excitement while we were in Nashvegas! I so miss the days when I use to take Alise and dress her up in her smocked dresses and/Halloween costume! Sigh. I hope your luncheon is going well today! I’m starving! Ha! Sorry I couldn’t make it! Have a great weekend, Andrea! Stay warm! The weather is great here! I love that Leith cardigan...perfect for fall! Great football pictures of your sweet family. Have a wonderful weekend. That shortbread looks so tasty! I picked up some pumpkin ice cream last weekend at Aldis and it was so good (was good because I totally ate it all!). That pumpkin patch looks adorable! That is so wonderful that your whole family was able to be there for senior night. I know you are just the proudest momma to have raised such amazing boys! Growing up, the pumpkin patch we used to always go to had pumpkin head characters / little set ups like that. It was my FAVORITE thing. So sad I haven't found anything similar around St. Louis. Bummer about the senior night loss, but it sounds like that was the only downfall of the night, having both your college boys home and a good game for your senior! Your family pictures from senior night just make my heart happy!! I LOVE them. Yay for all things fall. It finally truly cooled off this week here. Your pumpkin patch pics are so cute. Such a fun tradition. What a great family photo on Senior night! I know you are so proud of those boys! I love the pumpkin patch, I need to find one of those. Mother nature is drunk for sure, we are having a milder version of that. Have a great weekend! My hubby and I have an afternoon date today and going to see A Star is Born. Cant wait! Loved all your cute weekly outfits!! Have a fabulous weekend! Oh, I am so jealous of your fall pictures. We haven't been able to have much fun this fall at all as it has been constantly raining and COLD. So sad. Love all your outfits. I would love to "A Star Is Born" I heard it was so good, but I'm not thrilled with the reasons for the rated "R" rating. I guess I will have to wait for the edited version to come on tv. haha! That pumpkin patch looks fun! A Star is Born looks really good, but I haven't seen it yet. Isn't it such a wonderful time Andrea?? I love the pumpkin patch you visited....we went to one that was a bummer!! What a fun Friday favorites post. I love it all and so nice to see you and your husband with your boys. It sounds like fun going to the pumpkin patch too. You look so nice in all of your cute outfits. Hope you have a nice week ahead. You are just darling in the pumpkin patch and your boys are cutie pies. You are blessed. What a sweet family shot and a precious memory for you guys!! You surely will miss it next year but it sounds like you're savoring every moment of it! You looked adorable at the pumpkin patch, that sounds like a GREAT one! Our weather was crazy like that this past week, we had the AC and the heat on in one week! I love how you styled that pink sweater, I'm going to try and recreate your look! Sorry I missed this on Friday, new laptop issues had me out of the loop! Happy Monday! That is the cutest pumpkin patch. Love all the celebrity pumpkins. And that pink top is sooo pretty. I need it. Is it a light cardigan? Okay you are the cutest! I love your little bow in your topknot. That flannel is really so cute. I love the shade of the pink cardi. You styled it perfectly! 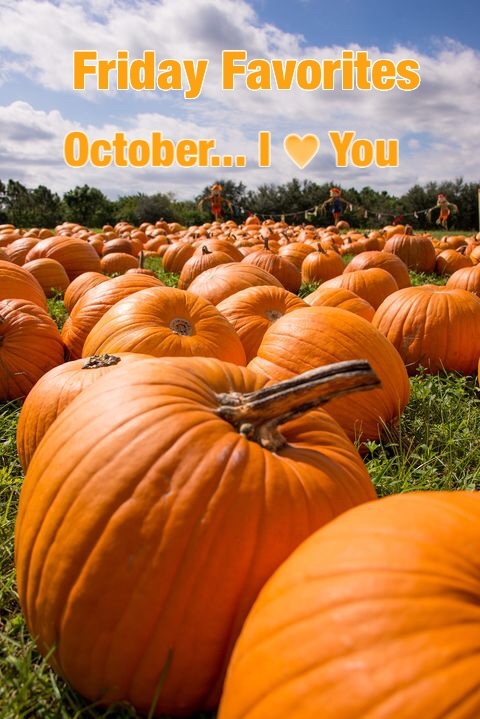 Love the month of October, it has always been my favorite month! Finally getting a bit cooler here in NC! Great pics of your family and football fun. The Presidentail pumpkins had me laughing! Great looks and love the pink duster on you. I finally joined the club and bought some sweater dusters for Fall/Winter. 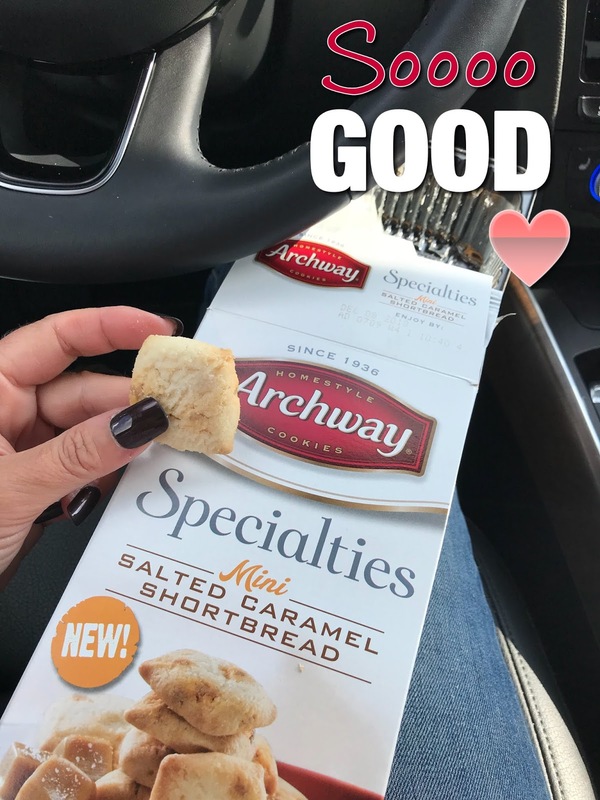 LOVE LOVE shortbread, so I am going to find those cookies!